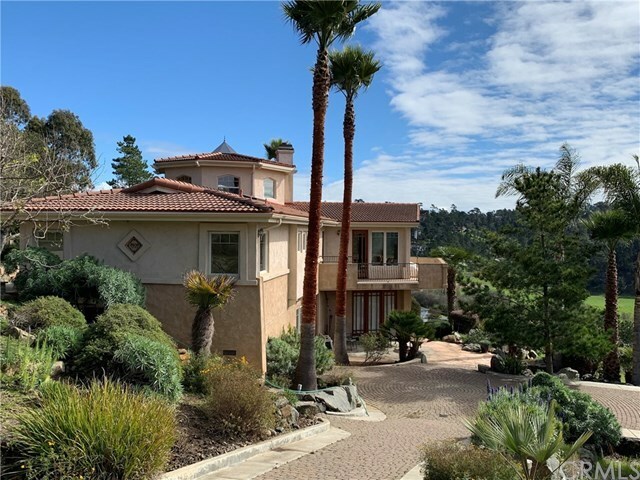 This Spanish style home built in 2002 lies above the village of Cambria, on a generous acre offering a unique view of the town and the pines rising above it. Big skies, tall trees, and vistas of the Fiscalini Ranch and meadow are amazing from this south facing home. Well appointed in design and construction there are cherry cabinets, wood floors, tile, granite, & stainless steel appliances. Skylights and windows are abundant. This home does not disappoint in size with its three bedrooms, living room with fireplace and deck, family room with wet bar, sun room, office/studio in the turret above and a full guest suite (bedroom, living room, Â¾ bath & guest kitchen) with separate entrance. Adjacent to the family room is a sunny patio, a perfect private place to enjoy the views & sunshine. A second driveway provides access to the back of the property and creates extra parking spaces in addition to the two car garage. This fantastic home is located off the beaten path, at the end of the cul-de-sac with just a few homes nearby on acreage. SLO county says ok for a horse. Directions: Going north on Highway One turn right on to Cambria Drive, then right on Main, then left on Pine Knolls, then right on Hartford, then right on Grove. drive to the end of Cul De Sac and stay to the right on the dirt driveway for about 100 feet.